Petshow, S. . and Wehrli, M. (2018). Preparation of Precisely Oriented Cryosections of Undistorted Drosophila Wing Imaginal Discs for High Resolution Confocal Imaging. Bio-protocol 8(3): e2725. DOI: 10.21769/BioProtoc.2725. The combination of immunofluorescence and laser scanning confocal microscopy (LSM) is essential to high-resolution detection of molecular distribution in biological specimens. A frequent limitation is the need to image deep inside a tissue or in a specific plane, which may be inaccessible due to tissue size or shape. Recreating high-resolution 3D images is not possible because the point-spread function of light reduces the resolution in the Z-axis about 3-fold, compared to XY, and light scattering obscures signal deep in the tissue. However, the XY plane of interest can be chosen if embedded samples are precisely oriented and sectioned prior to imaging (Figure 1). 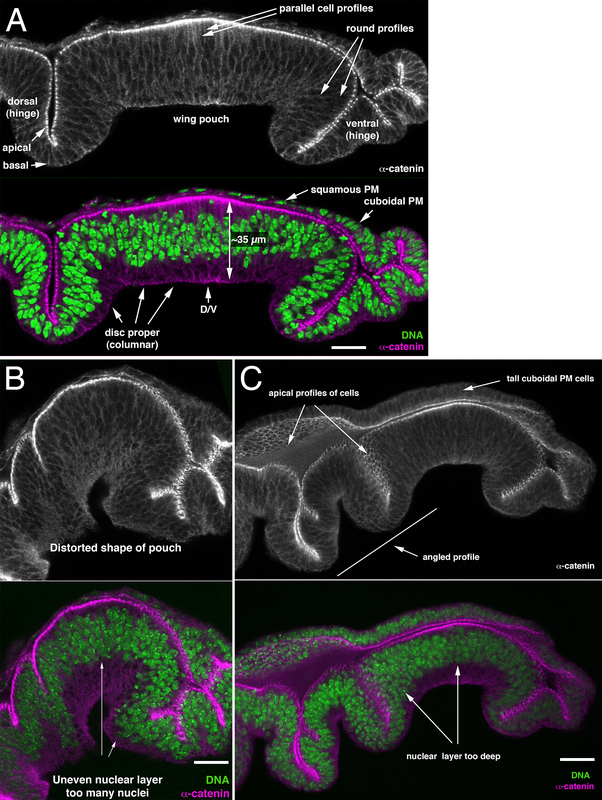 Here we describe the preparation of frozen tissue sections of the Drosophila wing imaginal disc, which allows us to obtain high-resolution images throughout the depth of this folded epithelium. Figure 1. The epithelial structure and undistorted folding pattern are revealed in its entire depth in this frozen section of developing Drosophila wing. A-D. Transverse dorsoventral sections through the wing pouch. A. Cryosection reveals nuclei (A, green) and subcellular distribution of α-catenin (A’, A”, magenta) with signal throughout the depth of the epithelium. The basal surface is clearly detectable (arrows). A” is digitally enhanced image of A’. B. A Z-stack of images collected in a top-down view displayed as XZ orthogonal view reveals nuclei (B) but little discernable detail for α-catenin (B’, B”) and even the digitally enhanced image (B”) fails to reveal the basal epithelial surface (arrow). C. Transverse dorsoventral section displaying the Distal-less (Dll, green) gradient in the wing pouch and subcellular localization of DE-Cadherin (magenta) throughout the epithelium. D. View of the wing pouch. Dorsal is to the left; apical is up. Scale bars are 1 µm in A, B, 11 µm in C, 5 µm in D.
Third instar imaginal discs are flat pocket-like involutions of the epidermis (Cohen, 1993; McClure and Schubiger, 2005). One layer of this pocket, the ‘disc proper’, is a pseudostratified columnar epithelium that is heavily folded at the onset of metamorphosis. It is continuous with the ‘overlaying’ squamous epithelium, the peripodial membrane. The focus of our work is to understand how the Wnt morphogen patterns the dome-shaped wing pouch region of the wing disc. As imaginal discs are flat overall, conventional imaging has them mounted for top-down or upside-down observation, whereby cover-slips compress and distort the folded structure. The use of spacers prevents distortions, but imaging of the entire wing pouch using Z-stacks has proved unsatisfactory or impossible; as outlined above, the reduced resolution in the Z-axis typically prevents high-resolution reconstruction of the epithelium in the apical/basal direction. Therefore, only the apical half of the epithelium of the wing pouch is detected at high resolution. This problem is exacerbated if weak signals are to be detected. Thus, uniform imaging requires a ‘side-view’ that can be obtained in sections. We modified a cryosection protocol (Culbertson et al., 2011; Sui et al., 2012) to obtain transverse sections of wing discs at defined angles. This methodology was critical to our analysis of signaling gradients in the wing pouch. Note: The product “Leica CM1850” has been discontinued. Note: For a more detailed protocol, see Klein (2008). Fix in Solution A (made fresh; see Recipes) on ice for 20 min. Wash 3 x with PBT (see Recipes) each for 10 min. Block in Solution B (see Recipes) for 1 h at room temperature. Perform immunostaining following the standard protocol (Klein, 2008). Post-fix in Solution A for 1 h at room temperature. Wash 3 x with PBT each for 10 min. Place on ice for 30 min to allow the gel to solidify. Note: Try to prevent condensation from forming on glass 9-well plate, as falling droplets might dilute the gelatin solution and interfere with gelation. Under the dissection microscope: Gently remove the wing discs from carcasses in PBT. Using a pipette, transfer the wing discs into a well of Solution C (sucrose, see Recipes) and incubate for about 60 min at room temperature. 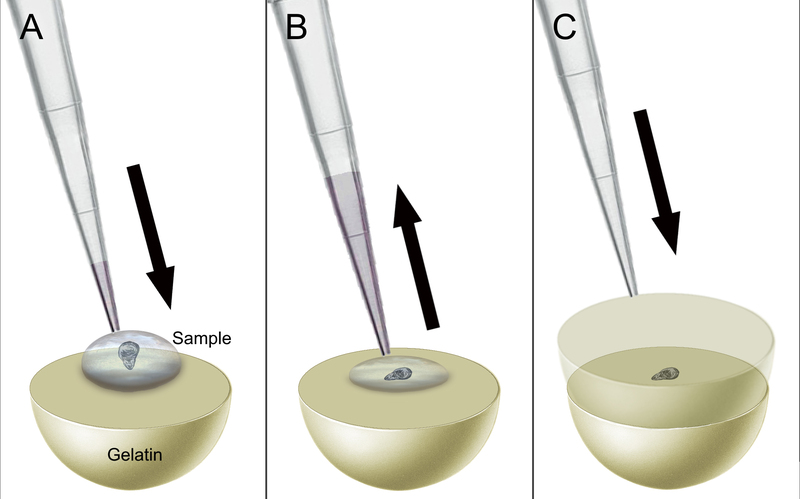 Transfer a single wing disc by pipette (in about 20 µl of liquid) from the sucrose solution onto the solidified gelatin (Figure 2A). Note: The disc should be placed directly into the middle of the well. Remove as much excess liquid as possible, ensuring that the disc is lying flat on the gel (Figure 2B). Apply an additional 300 µl of 50 °C Solution D (gelatin) on top of the wing disc (Figure 2C). Figure 2. Schematic representation of the gelatin embedding process. A. Transfer a wing disc to the gelatin by pipette. B. Remove excess sucrose solution from around the disc. C. Add an addition 300 µl of gelatin on top of the disc. Place on ice and allow the gel to solidify about 30 min. Under a dissecting microscope, use a razor blade to cut the gelatin into a block around the sample. Note: This should be done with regard to the desired orientation of the cryosection. For example, if cross-sections are desired across the wing pouch dorso-ventrally, one face of the gel block should be perpendicular to the dorsoventral boundary (Figures 3A and 3C). Figure 3. Orientation of wing discs in cut gelatin cubes. Wing disc stained with DAB to visualize expression of Wingless & Patched, for illustration, in trimmed gelatin blocks. A. Top-down view of a wing disc in gelatin cube. The red line indicates the face of the cube which should be placed face-down into the embedding capsule to acquire a dorsoventrally aligned section. B. ‘edge-on’ view of the wing disc from the direction indicated by the arrow in A. C. An alternatively angled cube which would allow for sections aligned 45° to the dorsoventral boundary. The red line indicates face of the cube which should be placed downward. Prepare a plastic embedding capsule by cutting off the conical tip with a razor (Figures 4A-4B). Place the gel cube with the desired face down onto the lid of a plastic embedding capsule (Figures 3B and 4C). Figure 4. Preparation of plastic embedding capsule. A. Plastic embedding capsule (Step B8 above). B. Cut the conical tip off from the capsule using a razor blade (the arrow indicates movement of the blade). Discard the conical tip. C. Place the sample with the desired cutting face downward onto the lid of the capsule (red cube, indicated by arrow). D. Close the capsule and fill from the top with tissue freezing medium (arrow indicates where to add medium). Gently fill the capsule with tissue freezing medium, allowing large air bubbles to escape (Figure 4D). Place capsule immediately into dry ice or a -80 °C freezer. Remove the frozen sample from the plastic embedding capsule. This is achieved by first removing the lid, then cutting away the remainder of the plastic capsule with a razor blade. Affix the sample to a cold (-80 °C) microtome sample holder using tissue freezing medium (Figures 5A-5B). With the cryostat chamber set to -24 °C, place the holder in the microtome (Figure 5C). Cut sections of 10-20 µm thickness. The anti-roll plate ensures a flat section comes off the knife (Video 1). Pick up tissue sections by gently touching a glass microscope slide to them. Create a row of sections (Video 1). Check under a fluorescence microscope for the presence of disc tissue in gelatin slices, and mark their location on the back of the slide. Add Fluoromount-G® atop the samples. Place a coverslip over the slide, seal with nail polish. Figure 5. Preparing samples for cryosectioning. A. An empty microtome sample holder; B. Sample affixed to holder using TFM; C. Holder with sample in the cryostat chamber. Video 1. Operation of the cryostat. The anti-roll plate, which is lowered at the beginning of the video, ensures the section remains flat. Note tissue sections will adhere to the microscope slide after gently coming in contact. Laser scanning confocal microscopy can be used to examine tissue sections. For context on the morphology of tissue sections, see Note 1. For a comparison of cryosectioned wing discs and xz optical sectioning, see Figure 1. The overall appearance of the wing pouch is symmetrical, with uniform height in the central part and relatively minor inward curvature near the ventral hinge region (Figure 7A). Sections through the nuclear layer have it appear about four nuclei deep and largely confined to the apical part of the epithelium (Figure 7A). Oblique sections through the dome-shaped epithelium may increase both thickness and position of the nuclear layer (Figures 7B and 7C). 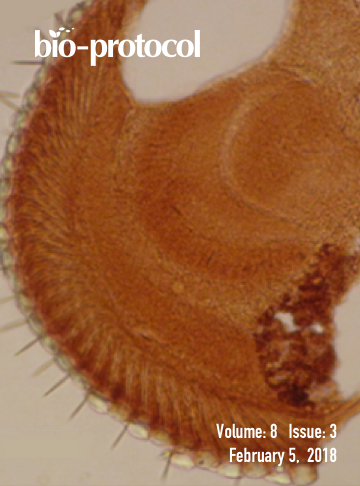 The epithelial height in the center of the wing pouch of the late third instar wing disc is approximately 35 µm (Figure 7). Oblique cuts are evident from a greater apparent height (Figure 7B). Cell outlines should be parallel (Figure 7A). Oblique cuts through cells reveal primarily the rounded outlines around nuclei, and the tube-like extensions that reach the apical and basal surface are not visible (Figures 7B and 7C). Figure 6. Tissue Section Examples. A. A near-perfect section through the wing pouch along the anteroposterior compartment boundary. The wing imaginal disc is a relatively flat sac, where the disc proper consists of a pseudostratified columnar epithelium; a simple cuboidal epithelium provides the transition to the simple squamous epithelium that makes up most of the (covering) peripodial membrane (PM). The wing pouch is dome-shaped and surrounded by folds of the future wing hinge (the ventral hinge region has a characteristic folding pattern in sections). The position of the dorsoventral compartment boundary is indicated (arrow, ‘D/V’); dorsal is to the left and ventral to the right. B. An oblique section through the wing pouch is evident from its uneven shape and nuclear layer, the epithelium is too high and of uneven height. C. Although largely in the dorsoventral direction, the section cuts slightly ‘diagonal’ across the disc. No clear parallel cell outlines are evident. The epithelium appears too high and of uneven height. Uneven depth and increased number of nuclei (> 4 nuclear profiles) identify an oblique cut. The sectioned wing pouch appears at an angle to the remainder of the disc, revealing a cut deviating from the dorsoventral axis. Scale bars are 15 µm in A, 9 µm in B, 12 µm in C.
In cutting gelatin with embedded tissue (Figure 3), it is important that the gelatin remain cold and rigid during the cutting process to facilitate precise cuts and proper angling. For achieving correctly angled sections, the gelatin cutting and the cryosectioning steps are critical. During gelatin cutting, it is important to ensure the wing disc lies perfectly flat (Figure 3B). During cryosectioning, it is important to ensure the microtome blade is cutting evenly across the face of the sample. If excessive background is present in the fluorescence micrograph, the following may help: ensure that the gelatin is fresh; ensure that no dye is present in tissue freezing medium (clear TFM is recommended); ensure that the sample was post-fixed properly. To alleviate further background, tissue sections on the slide may be carefully rinsed with PBT before mounting with Fluoromount-G® and coverslip. Occasionally, holes or vacuoles may appear in the tissue. We believe these arise if mismatched ionic concentrations of solutions are used during the procedure. We are grateful for discussions and improvements to this methodology to K. Hanson, J.M. Laumann, A. Snyder, M. Boardman, S. Kaech-Petrie, A. Nechiporuk and, in particular, M. Deza-Culbertson. This work was supported by grants of NIH (R01GM67029 & R01GM103876), NSF (IOS-1021573 & IOS-1353799), and the Medical Research Foundation (OR) to M.W. Authors have no conflicts of interest or competing interests. Cohen, S. M. (1993). Imaginal disc development. In: Bate, M. and Martinez Arias, A. (Eds.). The development of Drosophila melanogaster. Cold Spring Harbor Laboratory Press pp: 747-841. Culbertson, M. D., Lewis, Z. R. and Nechiporuk, A. V. (2011). Chondrogenic and gliogenic subpopulations of neural crest play distinct roles during the assembly of epibranchial ganglia. PLoS One 6(9): e24443. Klein, T. (2008). Immunolabeling of imaginal discs. In: Dahmann, C. (Ed.). Drosophila: Methods and Protocols. Methods Mol Biol 420: 253-263. McClure, K. D. and Schubiger G. (2005). Developmental analysis and squamous morphogenesis of the peripodial epithelium in Drosophila imaginal discs. Development 132(22): 5033-5042. Sui, L., Pflugfelder, G. O. and Shen, J. (2012). 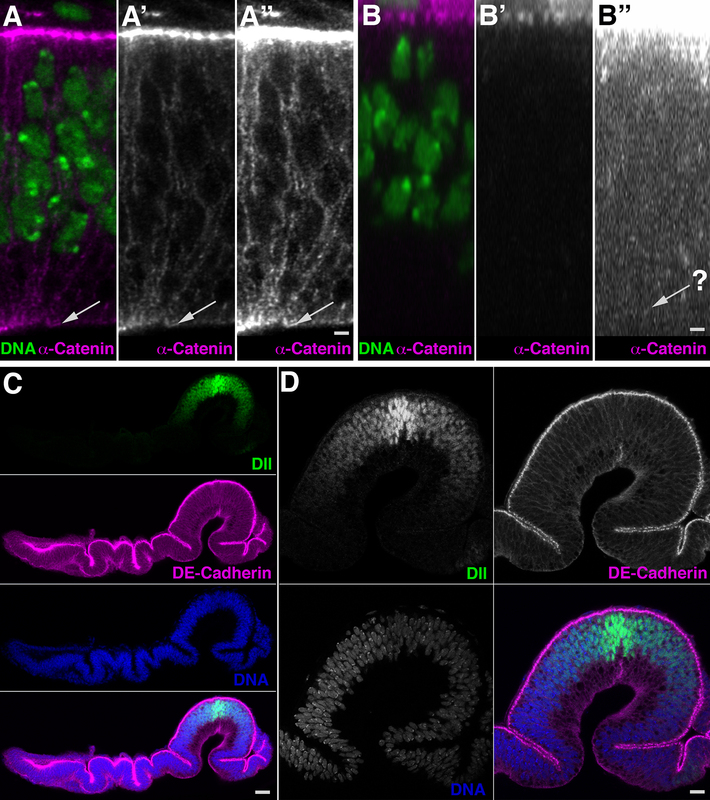 The Dorsocross T-box transcription factors promote tissue morphogenesis in the Drosophila wing imaginal disc. Development 139(15): 2773-2782. How to cite: Petshow, S. . and Wehrli, M. (2018). Preparation of Precisely Oriented Cryosections of Undistorted Drosophila Wing Imaginal Discs for High Resolution Confocal Imaging. Bio-protocol 8(3): e2725. DOI: 10.21769/BioProtoc.2725.